Specialty: Diagnosis and treatment for superficial tumor, gastrointestinal tumor, respiratory tract tumor, head and neck tumor and blood disease. 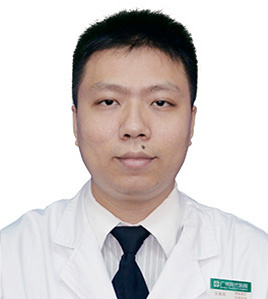 Dr. Ou Yuji graduated from clinical medicine school of Guangzhou Medical College, accomplished in diagnosis and treatment for superficial tumor, gastrointestinal tumor, respiratory tract tumor, head and neck tumor and blood disease, and skilled in various cancer treatments including radiotherapy, chemotherapy, biological therapy, perfusion of chest and abdominal cavity and thermal therapy etc. From 1998 to 2003, he studied in Guangzhou Medical College. After Dr. Ou graduated in 2003, he has devoted himself to cancer treatment for 12 years. At the beginning of working in oncology department, in order to master therapeutic techniques as soon as possible, he insisted on taking ward visit every day for several times, tracking record of each round, discussing and exchanging medical record and treatment program with every patient’s attending physician. With carefulness, patience and excellent medical skills, Dr. Ou tries his best to help patients build up anticancer confidence and reduce their pain.